CHICAGO, IL. What qualities make an object mysterious? It is easy to assume that the affect is a result of the unknowable, or the more auratic, outside forces of the thing at hand. But one could equally say that it is the thing itself, stripped bare of its abstract potentials, its ability to exist without interpretation, without meaning, utterly alien as an object and nothing more, absent of associations that shadow an object in secrecy, and gives us pause. This strange, yet elemental, interpretation of the mysterious is the same world navigated by Mindy Rose Schwartz in her current installation on view at QT Gallery. Schwartz presents us with a concrete world that exists without abstractness, though the potentials of her sculptures are nonetheless hypnotizing, bewitching, and enchanting. This type of total concreteness offers a peculiar clarity to otherwise familiar and mundane forms. Schwartz encounters the concrete with an overwhelming intensity. In short – her project may be simple, but is not easy to understand. It is charming – in the Romantic sense of the word – at the same time it is utterly recognizable. The ability to simultaneously elicit these opposite registers speaks to the objects’ statuses as symbols, where the concrete meets the imaginative, and is anything but normal. The collection of sculptures – both kinetic and static – on view within Schwartz’s installation demonstrates a willful appreciation of the more overseen possibilities of substance hidden within everyday materials. With an almost unmatched dexterity, Schwartz handles domestic materials – thread, wire, and plaster – in a way that somehow denies theatricality and artisanal hobby art. Instead, her forms stage a sort of dramatic realness through the eccentricity of her figures. New age mysticism is met with the nonspiritual mechanics of the works themselves; there is a push and pull between the uplifting and the more irreverent motion of the central component to the exhibition. 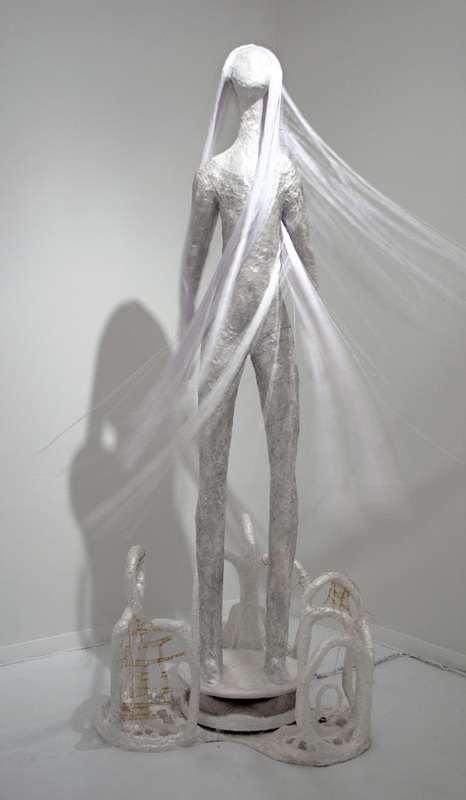 In a piece entitled You will live each day in Springtime, a thin spinning woman molded out of white papier-mâché occupies the tightly confined walls of the main gallery. Her proportions are just slightly taller and more delicate than a human form, existing somewhere between a music-box figurine and true-to-life model. Her stance is ethereal, hands outstretched to loosely to the side, legs just slightly more than hip-width apart, chest upstretched, and her featureless gaze directed diagonally upward. Most movingly is the figure’s impossibly straight long hair, which is made of thin white satin strings that whip around, grazing the surface of the walls, subtly creating their own breeze. The figure is forever frozen in a dizzying sense of ease and oneness. But there is a humor to the supposed peacefulness – how whole can this one moment ever be? Or perhaps better phrased, how far can bliss be stretched until it ceases being eternal, and is instead bound into a cycle endless repetition? The attempt is not at once Sisyphus-ian; it maintains an air of detachment from its situation – the figure is still an object, and with this status first and foremost, it is without consciousness. In another work, Windsong stays on my mind, the shadows define the delineation of form. 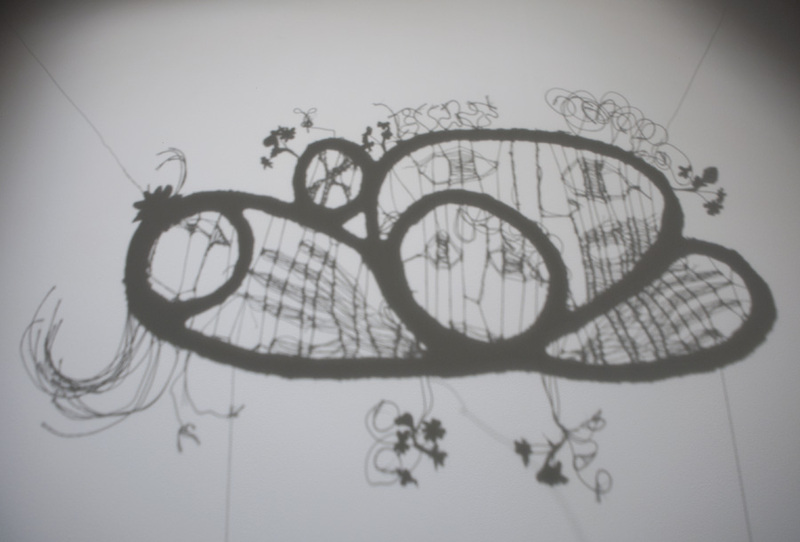 Here, a cloud-type dream catcher form holds a series of illustrations of many faces drawn in the negative space with woven gold wire – lines overlap over each other to mask some profiles, highlighting others. The illustration unfolds only through its silhouette, which is staged prominently in the center of the wall, the small metal ornament hung high and lit from behind by a sharp spotlight. The chance for the viewer to uncover the hidden is a trope within this exhibition, though it is not always clear what the uncovered passages may reveal. Schwartz’s tangible domain is palpable and feeling – one that is exciting, fresh, and appealing – but exists more as an aura, than as a pointed or specific annotation of experience. Indeed, the concrete can open doors, and it can close them too. Mindy Rose Schwartz at QT Gallery runs through June 29, 2014. Stephanie Cristello is the Editor-in-Chief for THE SEEN, a Staff Writer for ArtSlant, and the Chicago Contributor for New American Paintings. June 25, 2014 | Filed under Art Seen: Chicago and tagged with Mindy Rose Schwartz, QT Gallery, Stephanie Cristello.